Amplitude shift keying (ASK) in the context of digital signal communications is a modulation process, which imparts to a sinusoid two or more discrete amplitude levels. These are related to the number of levels adopted by the digital message. For a binary message sequence there are two levels, one of which is typically zero. Thus the modulated waveform consists of bursts of a sinusoid. Figure 1 illustrates a binary ASK signal (lower), together with the binary sequence which initiated it (upper). Neither signal has been band limited. There are sharp discontinuities shown at the transition points. These result in the signal having an unnecessarily wide bandwidth. Band limiting is generally introduced before transmission, in which case these discontinuities would be ‘rounded off’. The band limiting may be applied to the digital message, or the modulated signal itself. The data rate is often made a sub-multiple of the carrier frequency. This has been done in the waveform of Figure 1. One of the disadvantages of ASK, compared with FSK and PSK, for example, is that it has not got a constant envelope. This makes its processing (eg, power amplification) more difficult, since linearity becomes an important factor. However, it does make for ease of demodulation with an envelope detector.With bandlimiting of the transmitted ASK neither of these demodulation methods (envelope detection or synchronous demodulation) would recover the original binary sequence; instead, their outputs would be a bandlimited side. Thus further processing by some sort of decision-making circuitry for example – would be necessary. regeneration of the binary bit stream. Amplitude-shift keying is used extensively for commercial terrestrial. It is usefulness for satellite applications is limited. Space systems typically employ saturated power amplifiers. Frequency-shift keying (FSK) is a method of transmitting digital signals. The two binary states, logic 0 (low) and 1 (high), are each represented by an analog waveform. Logic 0 is represented by a wave at a specific frequency, and logic 1 is represented by a wave at a different frequency. The FSK mode was introduced for use with mechanical teleprinters in the mid-1900s. The standard speed of those machines was 45 baud, equivalent to about 45 bits per second. When personal computers became common and networks came into being, this signaling speed was tedious. Transmission of large text documents and programs took hours; image transfer was unknown. During the 1970s, engineers began to develop modems that ran at faster speeds, and the quest for ever-greater bandwidth has continued ever since. Today, a standard telephone modem operates at thousands of bits per second. Cable and wireless modems work at more than 1,000,000 bps (one megabit per second or 1 Mbps), and optical fiber modems function at many Mbps. But the basic principle of FSK has not changed in more than half a century. 2) HOW TO GENERATE FSK? The frequencies f0, f1 are usually harmonically related to the bit interval. 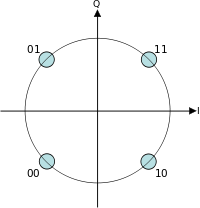 In the depicted example, f0=3T and f1=4T. As can be seen from the transmitted signal for our example bit stream (Figure 2), the transitions at bit interval boundaries are smoother than those of BPSK. Figure 2: This plot shows the FSK waveform for same bitstream used in the BPSK example. To determine the bandwidth required by this signal set, we again consider the alternating bit stream. Think of it as two signals added together: The first comprised of the signals0(t), the zero signal, s0(t), zero, etc., and the second having the same structure but interleaved with the first and containing s1(t) (Figure 3). Each component can be thought of as a fixed-frequency sinusoid multiplied by a square wave of period 2T that alternates between one and zero. This baseband square wave has the same Fourier spectrum as our BPSK example, but with the addition of the constant term c0. This quantity's presence changes the number of Fourier series terms required for the 90% bandwidth: Now we need only include the zero and first harmonics to achieve it. The bandwidth thus equals, with f0<f1,f1+12T−(f0−12T)=f1−f0+1T. If the two frequencies are harmonics of the bit-interval duration, f0=k0T and f1=k1T with k1>k0, the bandwidth equals k1+−k0+1T. If the difference between harmonic numbers is 1, then the FSK bandwidth is smaller than the BPSK bandwidth. If the difference is 2, the bandwidths are equal and larger differences produce a transmission bandwidth larger than that resulting from using a BPSK signal set. Figure 4:Two methods of frequency-shift keying (FSK). FREQUENCY-SHIFT KEYING IN MASTEROSCILLATOR CIRCUIT. Frequency-shift keying is used in all single-channel, radiotelegraph systems that use automatic printing systems. The advantage of FSK over on-off keyed CW is that it rejects unwanted signals (noise) that are weaker than the desired signal. This is true of all FM systems. Also, since a signal is always present in the FSK receiver, automatic volume control methods maybe used to minimize the effects of signal fading caused by ionospheric variations. The amount of inherent signal-to-noise ratio (SNR) improvement of FSK over AM is approximately 3 to 4 dB. This improvement is because the signal energy of FSK is always present while signal energy is present for only one-half the time in AM systems. Noise is continuously present in both FSK and AM, but is eliminated in FSK reception. Under the rapid fading and high-noise conditions that commonly exist in the high frequency (HF) region, FSK shows a marked advantage over AM. Overall improvement is sometimes expressed as the RATIO OFTRANSMITTED POWERS required giving equivalent transmission results over the two systems. Such a ratio varies widely, depending on the prevailing conditions. With little fading, the ratio may be entirely the result of the improvement in signal-to-noise ratio and may be under 5 dB. However, under severe fading conditions, large amounts of power often fail to give good results for AM transmission. At the same time, FSK may be satisfactory at nominal power. The power ratio (FSK versus AM) would become infinite in such a case. Another application of FSK is at low and very low frequencies (below 300 kilohertz). At these frequencies, keying speeds are limited by the "flywheel" effect of the extremely large capacitance and inductance of the antenna circuits. These circuits tend to oscillate at their resonant frequencies. Frequency-shifting the transmitter and changing the antenna resonance by the same keying impulses will result in much greater keying speeds. As a result, the use of these expensive channels is much more efficient. Any digital modulation scheme uses a finite number of distinct signals to represent digital data. PSK uses a finite number of phases, each assigned a unique pattern of binary digits. Usually, each phase encodes an equal number of bits. Each pattern of bits forms the symbol that is represented by the particular phase. Phase shift keying is a technique which shifts the period of a wave. This wave has a period of p, noted above. Also notice that the start of the wave's period is at 0. This is the same wave as the first, but its phase has been shifted. Notice that the period starts at the wave's highest point (1). So what's the point? It just so happens that we have shifted this wave by one quarter of the wave's full period. We can shift it another quarter, if we wanted to, so the original wave would be shifted by half it's period. And we could do it one more time, so that it would be shifted three quarters of it's original period. This technique of letting each shift of a wave represent some bit value is phase shift keying. But the real key is to shift each wave relative to the wave that came before it. BPSK (also sometimes called PRK, Phase Reversal Keying, or 2PSK) is the simplest form of phase shift keying (PSK). It uses two phases which are separated by 180° and so can also be termed 2-PSK. It does not particularly matter exactly where the constellation points are positioned, and in this figure they are shown on the real axis, at 0° and 180°. This modulation is the most robust of all the PSKs since it takes the highest level of noise or distortion to make the demodulatorreach an incorrect decision. It is, however, only able to modulate at 1 bit/symbol (as seen in the figure) and so is unsuitable for high data-rate applications when bandwidth is limited. In the presence of an arbitrary phase-shift introduced by the communications channel, the demodulator is unable to tell which constellation point is which. As a result, the data is often differentially encoded prior to modulation. Sometimes this is known as quaternary PSK, quadriphase PSK, 4-PSK, or 4-QAM. (Although the root concepts of QPSK and 4-QAM are different, the resulting modulated radio waves are exactly the same.) QPSK uses four points on the constellation diagram, equispaced around a circle. With four phases, QPSK can encode two bits per symbol, shown in the diagram with gray coding to minimize the bit error rate (BER) — sometimes misperceived as twice the BER of BPSK. The mathematical analysis shows that QPSK can be used either to double the data rate compared with a BPSK system while maintaining the same bandwidthof the signal, or to maintain the data-rate of BPSK but halving the bandwidth needed. In this latter case, the BER of QPSK is exactly the same as the BER of BPSK - and deciding differently is a common confusion when considering or describing QPSK. Given that radio communication channels are allocated by agencies such as the Federal Communication Commission giving a prescribed (maximum) bandwidth, the advantage of QPSK over BPSK becomes evident: QPSK transmits twice the data rate in a given bandwidth compared to BPSK - at the same BER. The engineering penalty that is paid is that QPSK transmitters and receivers are more complicated than the ones for BPSK. However, with modern electronicstechnology, the penalty in cost is very moderate. Offset quadrature phase-shift keying (OQPSK) is a variant of phase-shift keying modulation using 4 different values of the phase to transmit. It is sometimes called Staggered quadrature phase-shift keying (SQPSK). Taking four values of the phase (two bits) at a time to construct a QPSK symbol can allow the phase of the signal to jump by as much as 180° at a time. When the signal is low-pass filtered (as is typical in a transmitter), these phase-shifts result in large amplitude fluctuations, an undesirable quality in communication systems. By offsetting the timing of the odd and even bits by one bit-period, or half a symbol-period, the in-phase and quadrature components will never change at the same time. In the constellation diagram shown on the right, it can be seen that this will limit the phase-shift to no more than 90° at a time. This yields much lower amplitude fluctuations than non-offset QPSK and is sometimes preferred in practice. This final variant of QPSK uses two identical constellations which are rotated by 45° (π / 4 radians, hence the name) with respect to one another. Usually, either the even or odd symbols are used to select points from one of the constellations and the other symbols select points from the other constellation. This also reduces the phase-shifts from a maximum of 180°, but only to a maximum of 135° and so the amplitude fluctuations of π / 4–QPSK are between OQPSK and non-offset QPSK. On the other hand, π / 4–QPSK lends itself to easy demodulation and has been adopted for use in, for example, TDMA cellular telephone systems. The modulated signal is shown below for a short segment of a random binary data-stream. The construction is the same as above for ordinary QPSK. Successive symbols are taken from the two constellations shown in the diagram. Thus, the first symbol (1 1) is taken from the 'blue' constellation and the second symbol (0 0) is taken from the 'green' constellation. Note that magnitudes of the two component waves change as they switch between constellations, but the total signal's magnitude remains constant. The phase-shifts are between those of the two previous timing-diagrams. The wireless LAN standard, IEEE 802.11b-1999, uses a variety of different PSKs depending on the data-rate required. At the basic-rate of 1 Mbit/s, it uses DBPSK (differential BPSK). To provide the extended-rate of 2 Mbit/s, DQPSK is used. In reaching 5.5 Mbit/s and the full-rate of 11 Mbit/s, QPSK is employed, but has to be coupled with complementary code keying. The higher-speed wireless LAN standard, IEEE 802.11g-2003 has eight data rates: 6, 9, 12, 18, 24, 36, 48 and 54 Mbit/s. The 6 and 9 Mbit/s modes use OFDM modulation where each sub-carrier is BPSK modulated. The 12 and 18 Mbit/s modes use OFDM with QPSK. The fastest four modes use OFDM with forms of quadrature amplitude modulation. Bluetooth 2 will use π / 4-DQPSK at its lower rate (2 Mbit/s) and 8-DPSK at its higher rate (3 Mbit/s) when the link between the two devices is sufficiently robust. Bluetooth 1 modulates with Gaussian minimum-shift keying, a binary scheme, so either modulation choice in version 2 will yield a higher data-rate. A similar technology, IEEE 802.15.4 (the wireless standard used by ZigBee) also relies on PSK. IEEE 802.15.4 allows the use of two frequency bands: 868–915 MHz using BPSK and at 2.4 GHz using OQPSK.